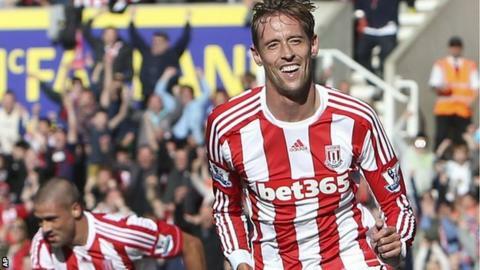 Peter Crouch ended Stoke's search for a Premier League win as they inflicted a third straight defeat on Swansea. Poor Swansea defending from a corner allowed the unmarked Crouch to head home the opener. He then fired in his second from close range after a cross had been muscled towards goal by Jonathan Walters. Danny Graham played in Michu for the visitors' best chance but the striker toe-poked his effort wide from 25 yards. Crouch scored the last winning goal for Stoke against Wolves back in April and this victory was rarely in doubt against a Swansea side almost unrecognisable from the team which started the season with such purpose and guile. This victory ended Stoke's 11-match streak without a win. Tony Pulis, the Stoke manager, will have a wry smile after his so-called 'one-dimensional' Potters side put a Swansea team, known for their passing style, to the sword in such an emphatic fashion. Stoke are now unbeaten in 10 at the Britannia Stadium. The last time they went 10 without defeat in the top flight was in 1973. Swansea have seven points from five games so far this campaign, compared to five at this stage last season. Swansea boss Michael Laudrup saw his side score 10 goals in their first three games, but have now failed to score in their last three matches in the Premier League. Their defensive frailties will be a major concern for him. This match was billed as a clash of very different footballing philosophies, with Stoke's more direct 'route one' approach up against Swansea's trademark 'pass and move' game, which has served them so well in the Premier League. Stoke's renowned aerial threat was evident when Crouch, the former England striker, put the home side ahead when the visitors allowed the 6ft 7ins centre forward a free header from a corner to make it 1-0 after 12 minutes. Swansea goalkeeper Michel Vorm, who signed a new four-year deal at the Liberty Stadium in midweek, was exposed and did not stand a chance as the Welsh side's brittle defence was breached once more. The home side controlled the first half and Vorm's goal was under constant threat. The mere presence of Crouch inside the Swans penalty area caused panic among the visitors' defence. It was Crouch again who took advantage of a speculative cross into the penalty box to stretch his side's lead to 2-0, but it took him two attempts to score his second. Crouch, who made 42 appearances for England, had a chance to grab his hat-trick towards the end of the game but his header, after a good cross by substitute Matthew Etherington hit the bar. Swansea did play with more direction in the second half, but the damage had already been done and Stoke were happy to defend their first-half lead to claim a well-deserved three points. Stoke manager Tony Pulis: "I thought we played really well in the first half and we didn't want half time to come. Swansea had a good spell after that but we came back at the end. "Peter Crouch was exceptional today and he is unlucky not to have a hat-trick." Swansea boss Michael Laudrup: "We talked in the week about set-pieces being important and stopping Peter Crouch and we couldn't do that. We haven't scored for three league games in a row so that is something we have to improve on."